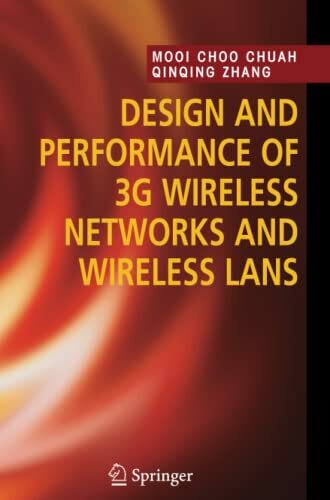 Design and Performance of 3G Wireless Networks and Wireless LANs is for wireless communication system engineers, network engineers, professionals, and researchers. Network architectures of UMTS, CDMA2000 systems, and how major network elements within the 3G networks can be designed, are described. In addition, the authors describe how end-to-end performance for voice and data services can be determined. They also provide guidelines on how radio access networks and core networks can be engineered. Of equal importance, is inclusion of explanations of various wireless LAN standards (IEEE 802.11a, 802.11b, 802.11g, 802.11e) and how voice and data services can be offered in the wireless LAN systems. Additional highlights include: - Overview of core principles of wireless communications (e.g. FDMA, TDMA, CDMA) airlink capacity analysis, and evaluation. - Traffic model descriptions and illustrations for circuit-switched and packet-switched services. - In-depth coverage of how base station and radio network controller can be designed to meet capacity requirements. - Discussion of unique design issues in 3G networks, innovative solutions, and possible new 3G features. This material also provides capacity engineering guidelines for 3G networks and wireless LANs. Review exercises are provided at the end of each chapter to facilitate teaching and self study.